In our previous post on task-based lighting, we showed that a watt is not the right measure for brightness and we should use lumens instead. We then went around the shops in our area and then carried out online market survey to find out different types of CFLs and Fluorescent tubes available in the market in India, and give our readers some comparative figures to help them buy a CFL or a Fluorescent tube. We collected wattages, lumens, color temperature and prices of various types of CFLs, FTLs and Bulbs available in the market. The data below is analysis of the data we collected. We hope that it will help you pick and choose the right kind of lights for your use. Please note that we just surveyed the regular shops and stores that contain most commonly sold products. This information does not represent lights that may be available in specialized lighting stores. Although information about some specific brands (Osram, Havells, Bajaj and Philips) is available on their websites mentioned below. Most common wattages of incandescent bulbs that are available in Indian market are from 15 to 100 (although some high wattage bulbs of 200, 300 and 500) are also available. These bulbs come in 3 different types of shapes: round, tapered and flat top as shown in the images below. Also please note that the bulb available in market named “zero watt” bulb is actually 15 watts bulb. Wattages, Lumens (brightness) and price for different types of incandescent bulbs are as shown below. We observed that flat top bulbs are brighter than round ones, although round ones are the most commonly available bulbs. CFLs provide a lot of options to the Indian consumers and they are available in multiple shapes, watts and color temperatures. The wattages available vary from 5 to 85 with a lot of options of choosing something in between the 2 numbers. They provide better brightness (lumens) per watt and thus are a good replacement of incandescent bulbs. They are available in 2 shapes: linear and spiral as shown below. 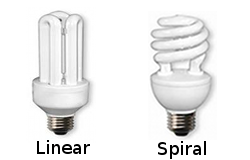 Spiral type CFLs are brighter (more lumens) than Linear CFLs and thus are costlier than Linear CFLs of same wattage. CFL providing warm white (yellowish) light are brighter (more lumens) than those with cool daylight (white) type light. 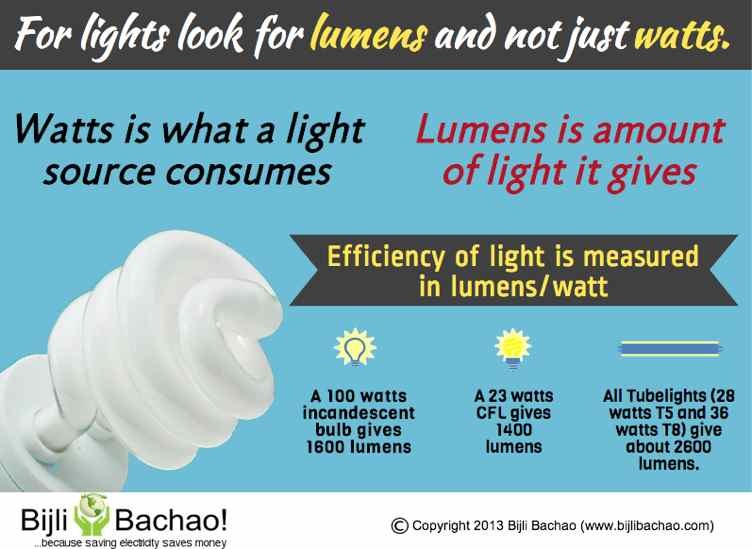 Popular Brands (like Philips, Osram, Bajaj and Havells) provide more lumens (brightness) per watt than the other lesser-known brands for the same wattage bulb. So popular brands are more efficient. CFLs also have power factor on their labels, so if you have a commercial connection and are getting power factor penalty regularly on your bills, make sure that you choose the CFL which provides higher power factor (>0.85). *The rows marked in yellow are the most commonly available type of CFLs in the market. CFLs have inbuilt choke and so there is no extra cost for fittings. 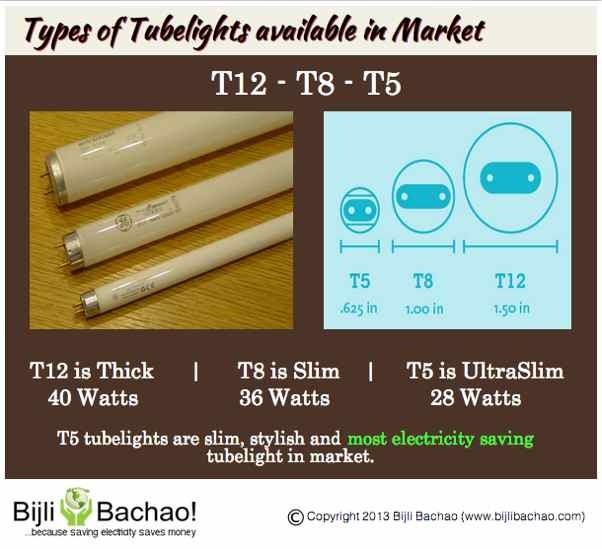 There are three kinds on Fluorescent tubes commonly available in the Indian market: T12, T8 and T5. Most commonly they come in 4 ft size, but T5s are also commonly available in 2 ft size. These tubelights come in other sizes as well, but they are not available in regular market. 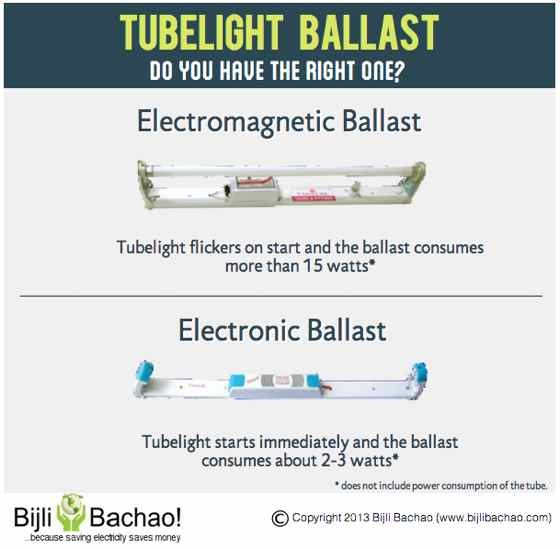 Most 4 ft tubelights have same brightness leaving one type of T8, which is high output T8 tubelight. T5 tubelights are available in 2 colors: Warm White (Yellowish) and Cool Daylight (White). The observation on light color remains the same with tubelight as with CFL: the brightness is more with Warm White tubelight. *The prices above are just for the tubes and not for the tubelight fittings. They come for extra cost. 100 watt * 10 hour = 1000 watt hour = 1 kWH = 1 unit. You can check how much a unit will cost, you can use our calculator at this link: Electricity bill Analyzer.